Organisational change is the work of people. It’s all about the way people reach, involve, convince, question and inspire each other. A change is after all not successful until people can commit to it, when they feel intrinsic motivation to show the behaviour that brings change into being. But the road to commitment is paved with pittfalls, because of which people drop out of the conversation or show persistent resistance. In How to get commitment? Annemarie Mars has converted her many years’ practical experience into five forces in order to stimulate commitment with people. For everyone who wants to leave their mark on organisations that are in continuous motion. In 2007 How to get commitment? was awarded the Gids award by a jury of professors and top HR managers. In this second reviewed edition, Annemarie incorporated a decade of progressing insight she learned in her permanent search for leadership in change. A change can succeed when the people affected by the change commit to it. That is far more than just ‘acceptance’ or ‘getting them to do it’. 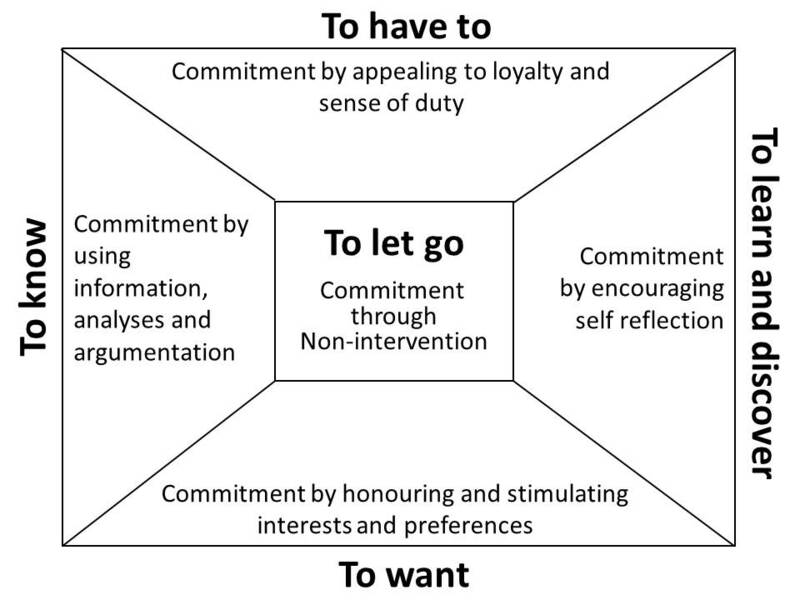 Commitment entails they understand the change, that they feel qualified to be able to display the required behaviour and that they shoulder responsibility for one’s own role within the change. 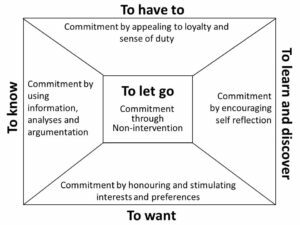 Commitment is a reaction to change that may emerge from a capricious and individual process made up of different other reactions : denial, resistance and self reflection. In order to process these reactions and to stimulate commitment you may benefit from five forces. While doing so, we see change as a movement from “A to B” on a thoroughfare. This road will never be a straight line as organisations will always remain too elusive and reality too unpredictable. These five forces are urgency, ambition, planning, interaction and leadership. The relationship forms the foundation on which the forces do their work. These five forces stem from the much heard premise “change is communication, communication and communication”. On the proviso that communication is seen as a two-way verbal street, a reason to denote it with the term interaction. 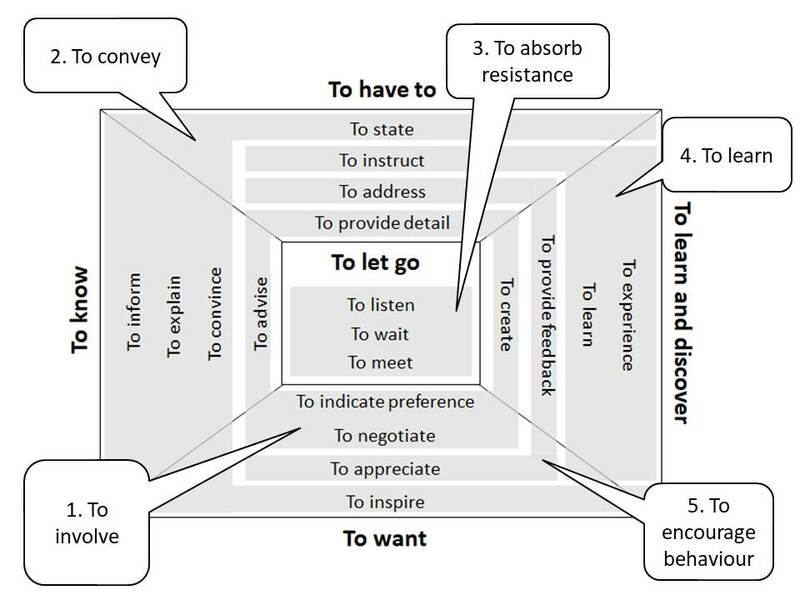 Interaction is in the heart this resources model. However interaction depends entirely on the substance of the narrative of the change. The first two forces, urgency and ambition, supply the necessary ingredients for this narrative. Urgency, which provides pushing power, is a much underutilised force. Many changes have their origins in obligation (“we have to comply due to top management demands”) or as a desire (“We want to implement new working practices”). Clearly stating and exploiting the underlying problems which have caused the need for change can exert relevant influence. Problems are often sought within the organisation itself: compartmentalization, poor result orientation or antiquated systems. However the organisation is only a means. The real urgency must be found in the organisation’s performance. The seriousness of the performance problem subsequently makes clear if the change is worthwhile considering between all other priorities which also require the organisation’s attention. 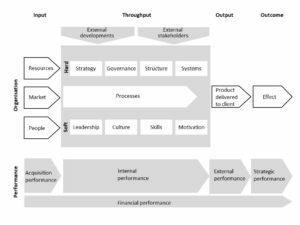 The causes of performance problems are often to be found in the organisation design. 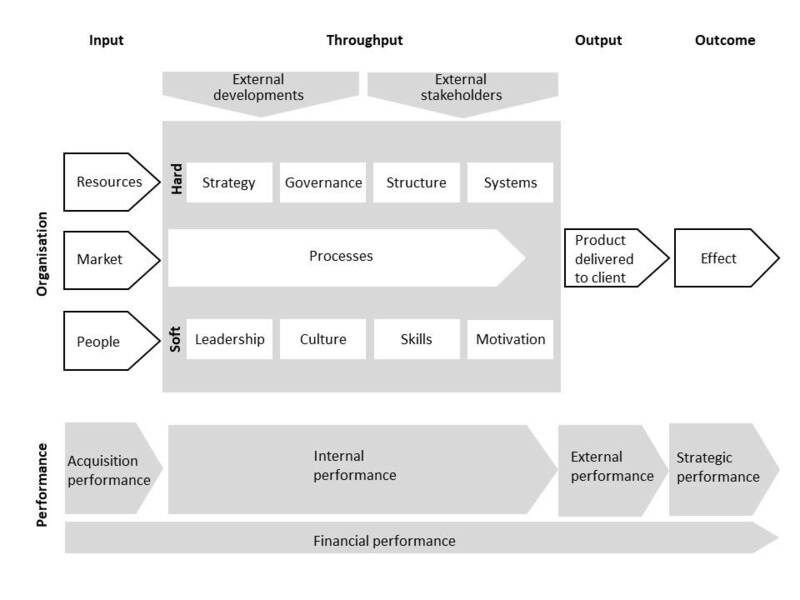 The organisation and performance model can help to assign these problems and to unravel their organisational causes. By observing who is hindered by the problem and who profits from it, the interests surrounding the problem can become clear. This way an estimation can be made what resistance is to be expected. However it is not self evident that people are (already) experiencing the problem. When you accuse them of this lack of awareness, you may be very well barking up the wrong tree. Stimulating a sense of urgency by making the problem visible and tangible, can stimulate them to leave denial. Ambition is a pulling power which offers perspective and supplies a sense of direction. People are able to commit more easily to change once it is obvious what their work will resemble when they reach point B. The more specific and attractive this ambition is, the greater the pull. However that should not encourage you to present the change as more attractive than it actually is. Just as with urgency, it is important to make a distinction between the intended organisational change and the desired performance improvement. 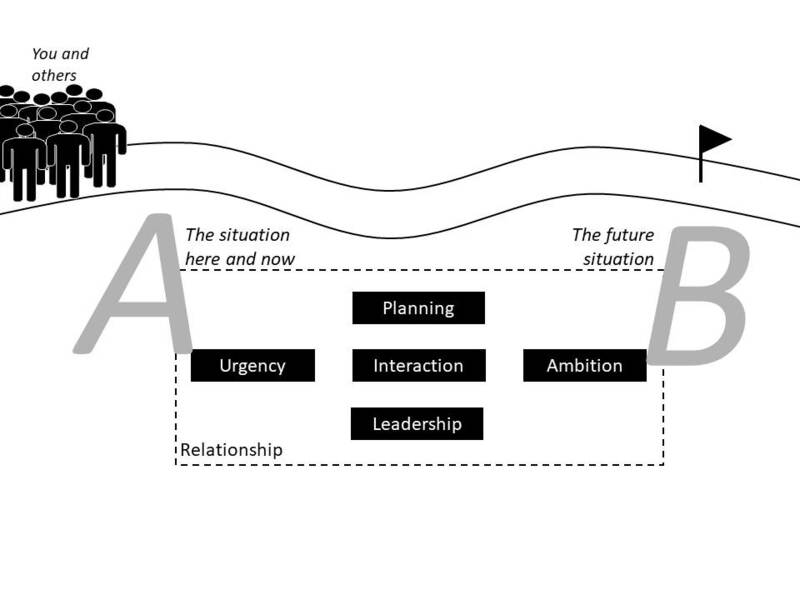 The latter provides direction, the former ensures a sustainable and anchored change. The organisation and performance model can once again help in making the right choices. However this is not enough to bring the ambition to life. It is especially relevant to the other what the change will entail for him and what the pros and cons thereof will be. 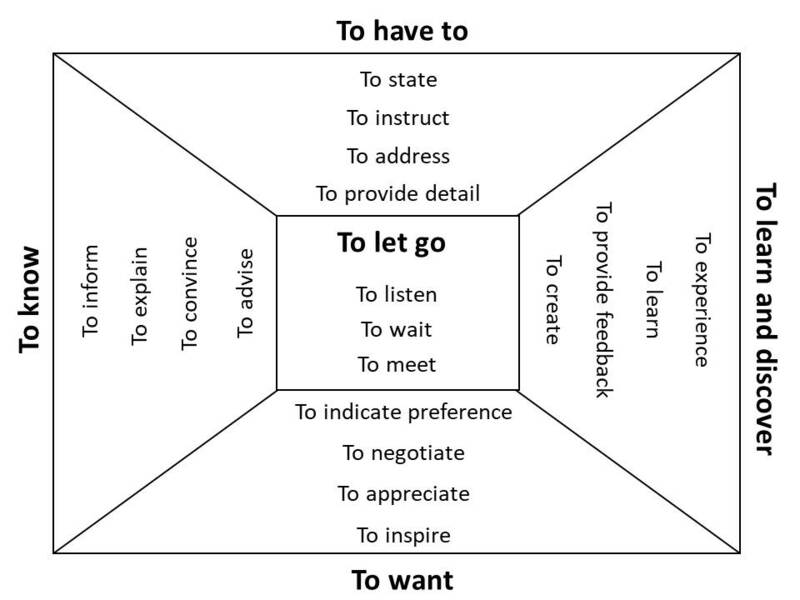 You can utilise several ways to bring the change to life, in order to make it as tangible as possible, e.g. by leading by example, by means of using images and metaphors or by excursions, narratives and simulations. Planning is the bridge that connects the change narrative and the change process. In chapter 4 we become acquainted with five change strategies: To know, To have to, To learn and discover, To want and To let go. In each change strategy one cedes certain space and you enact another leadership role. And the other person will undoubtedly use the same strategies to exert influence on you too. There are combinations that work well and those which hinder each other. You can vary per phase and per target group, however you must guard against an approach with “a bit of everything” which may create confusion on the given space. 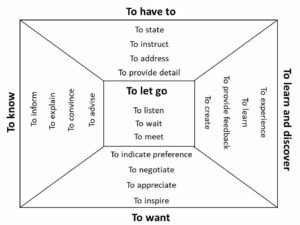 There are multiple considerations when making a choice: the space that you have, the content of the ambition (enabling you to move from A to B following the principles of B) the reactions of the target group and your own natural leadership style. Your plan should arise from your change strategy. In one change you may only plan the first step, in another you may look further ahead. How ever far you plan ahead, the substance and the process must come together in each step. The decisions to be made and the associated interactions needed to reach and involve people are integrated in each given step. To furnish your plan you can choose from several interaction forms. Interaction is key. You can’t earn commitment by means of a piece of paper or a digital screen. 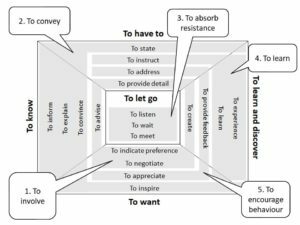 In interaction you involve people, convey change, absorb and work on resistance, enable learning and stimulate the behaviour of B. In chapter 5 we will take a closer look at these five clusters of the forms of interaction. Because the main pitfalls lie where confusion reigns between each of the clusters. There are different ways to involve people (1): getting their advise, providing detail, creating, indicating preferences and negotiating. When the other person has a minimum of space one can refer to this as providing detail. Advising and creation are often confused with each other, however when you ask someone for his advice you ask him how to change the work of others, when you engage him in creation, you involve him on the change of his own work. Neither form can be done justice when the people involved have opposite interests. When it is important that the people involved stand up for their own interests, you might better involve them through indicating their preferences or negotiation. There are multiple ways to convey a message (2): inform, explain, convince, state and inspire. Each approach depends on the opportunity of the other person to ask questions, address doubts and to discuss the change. In order to absorb resistance (3) listening is the appropriate approach. The key is to receive the other’s reaction and to recognise his emotions and interests. 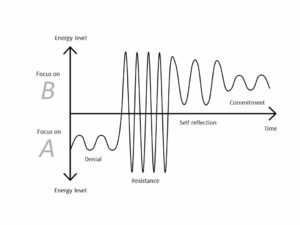 Resistance is always a reason to ask yourself whether a point of concern or risk should be taken seriously, because it reduces the chance of success of the change. What won’t work to absorb resistance is to try to convince the other, to kindle his enthusiasm or to give up. 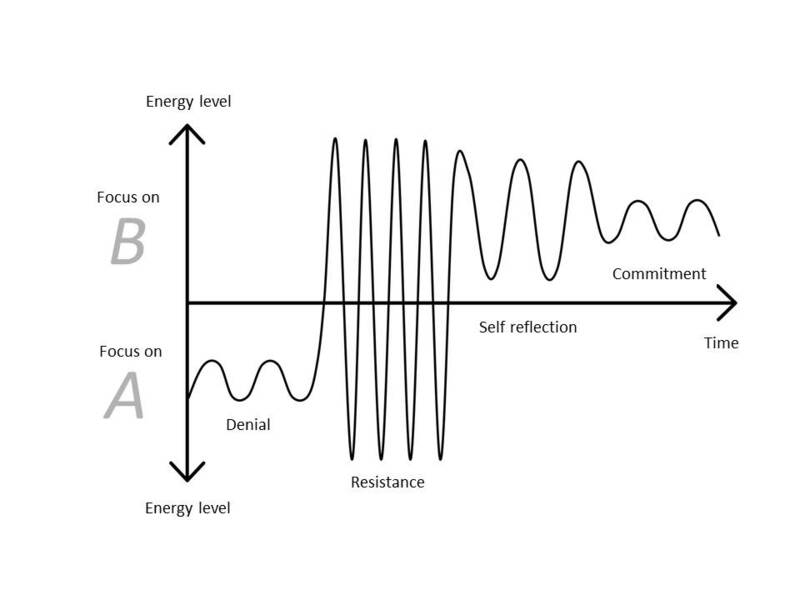 Only when it is clear where his resistance is coming from are you able to look at your options to act upon it. When resistance raises its head within a group it is particularly difficult to intervene, as in the heat of the interaction several other points of view may be simultaneously bandied about. The most important task is then to identify all the relevant questions and doubts before discussing them. In this way the quieter and positive participants have the chance to speak up and at the same time you can get a more representative view of the group dynamics. To learn (4) in the true meaning has to be reserved for the Learning and Discovery change strategy. However through instruction and explanation it is also possible to provide people with a new insight. Learning floats on the reflection of the target group with regards to their own effectiveness. In this way one’s learning need is increased. But if one is resistant it is impossible to be reflective so this form of interaction is inappropriate. By means of giving appreciation and feedback and by addressing the other person you are able to stimulate the behaviour of B (5). The use of material rewards alone is counter-productive since it works as a perverse stimulus, immaterial rewards such as compliments cost less, are more effective and less susceptible to inflation. By means of feedback you present the other person with a mirror for personal reflection. Should you show disappointment when the other refuses to do anything with your feedback, you were actually addressing him, which is a much heavier intervention. If you hesitate to address him for that reason, you are giving him the signal that his behaviour is acceptable. Finding the right dosage is an art in itself! When you are angry when addressing someone or when you address him in the presence of others you are likely to damage the relationship and as such also damage the change itself. You won’t find any huge and riveting explanations about leadership from CEO’s, sport heroes and world leaders as role models in this book. That stimulates above all talk about parties that are not even present in the conversation. The essence of your leadership in change is that you demonstrate your own commitment and you show that you are fully focussed on the other person. The road to leadership lies in curiosity or in other words the deferral of judgement with regards to (the resistance of) another. In change an anchor point is needed. This anchor point which has a steering role has the prerogative of the ‘supreme leader”, the one responsible for the change and the one “whose” people are the target group of the change. This steering role can also be laid within a group of leaders. The focus of the steering committee members should not only be concerned with the substance of the change but also on earning the commitment of the target group. The chance of success is greater when individuals are nominated within the steering group that carry a hierarchical responsibility, not individuals with solely an advising role. A common pitfall is that the interaction with people in the organisation is predominately done by advisors or project leaders, leaving little room for middle management to act as leaders as well. However when people take stock of the situation they will also look at their own superiors. When they come over as indifferent or present themselves in a disapproving manner, people will draw the conclusion that the change is not important. The main reason why middle management is not involved is because change agents resist their resistance. But then they miss the deeper causes of their reaction. Their resistance is often understandable whilst their leadership is equally crucial. So avoiding middle management is not an option. All five forces must be employed to involve them as a specific target group. Change often involves a lot of work. The coordinator or project leader fulfils the co-ordinating role and his main challenge is not to take over the steering role from the “supreme leader.” The word “project leader” has already caused enough mischief as the person holding this title has seen his title as the legitimatisation to feel solely responsible for the commitment of the target group. He may come a long way doing this, however he will eventually come a cropper when line managers are sending out a contrary signal. However as a central figure, he can add great value, reason enough choose a suitable candidate for the job and give him enough time. A warm relationship is a target in itself and it is the means which makes change possible. Because only in a warm relationship people are receptive for each other’s influence. Even though nobody aims for it, it is often the case that it is this relationship that gets in the way of the desired change. This is for example the case when consciously or unconsciously a reproach of the other person has snuck into the interaction. In each change strategy you will find ways to strengthen the relationship. However these ways only work when they are really meant. 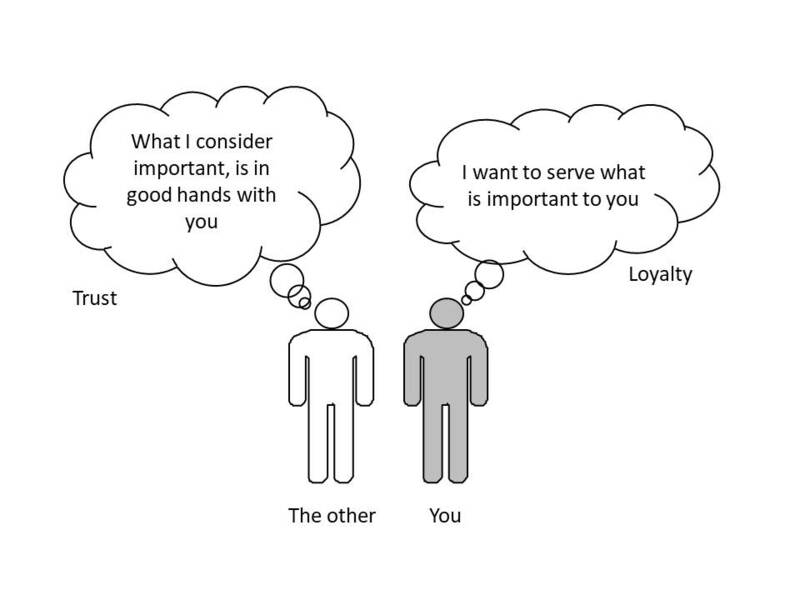 And you only really mean it when there is a deeper underlying need and that is loyalty: the need to serve for what you believe to be important for the other. When the other feels your loyalty, then he feels that what he finds important is in your good hands. That is what I call trust. Trust is a measurement of how good a relationship is. It is not a button you can press on the other person. This button is a part of you and is called loyalty. 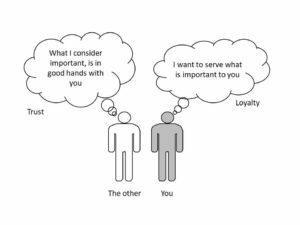 When the other involved also feels loyalty with regard to you, then the relationship is mutual which is an excellent and sustainable basis for co-operation and for coping with any change. Being loyal is not the same as indulging the other and setting your own interests aside. You have to create a balance between several interested parties of which you are also a part of. In this situation you can demonstrate your loyalty by weighing all interests in any decisions you make and to be clear in the considerations and choices you have made during this process. The weighing of interests within your force field particularly become a challenge when third parties ( e.g. people expressing resistance) are tugging harder than another. When you indulge those who tug the hardest you give a signal that those who tug the hardest win the day. The trick is to share your attention over your whole forcefield. Should you lose your loyalty for whatever reason, the other becomes your opponent. No doubt he will sense this. The immediate effect is that from that moment on the irritation is mutual. You’ve both stepped into the arena. In the arena the goal is no longer to help the situation but to reprimand the other. You avoid the arena by means of self-control and by seeking a place where you can assess your own reasons for losing your loyalty.